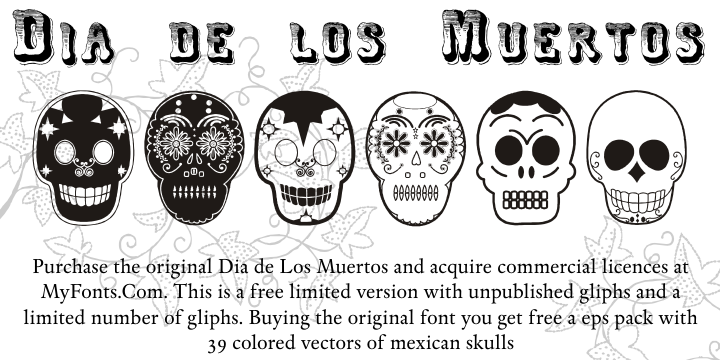 Dia de los Muertos font is dingbat font which is designed by Intellecta Design. 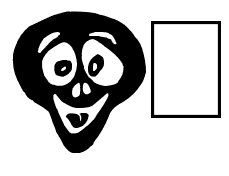 This font is labeled as Horror font. Dia de los Muertos font family has 1 variant. Dia de los Muertos Free Version, by Intellecta Design Dia de los Muertos Free Version has unpublished gliphs in a special free set, with a limited number of gliphs. Buying “Dia de los Muertos” (at MyFonts.Com) you get FREE a amazing set of eps vectors : 39 naive, intrincated and colored funny skulls, ready to use." To purchase the original font and to acquire commercial licences, please, visit: http://new.myfonts.com/fonts/intellecta/dia-de-los-muertos/ Visit my commercial library : http://new.myfonts.com/foundry/Intellecta_Design/ Donations are appreciated! ================================================================================== Dia de los Muertos is a colorful collection of skulls based on the lively Mexican fiesta celebration where skulls are used as humorous epitaphs of people still alive, besides being a symbol of celebration. A work of Iza W that can be used for children in arts, arts crafts, among other applications. Buying “Dia de los Muertos” you get FREE a amazing set of eps vectors : 39 naive, intrincated and colored funny skulls, ready to use." Dia De Los Muertos Limited Free Version font is one of Dia de los Muertos font variant which has Regular style. This font come in ttf format and support 0 glyphs. Based on font metric, Dia De Los Muertos Limited Free Version Regular has usweight 400, width 5, and italic angle 0. This font is labeled as .